is scheduled for its mid-December debut, lifting off aboard a SpaceX Falcon 9 launch vehicle from Launch Complex 40 at Cape Canaveral Air Force Station, Florida. Just as important is the teamwork and partnerships across the entire space enterprise, from SMC's Launch Enterprise Directorate to satellite manufacturer Lockheed Martin and launch provider SpaceX. 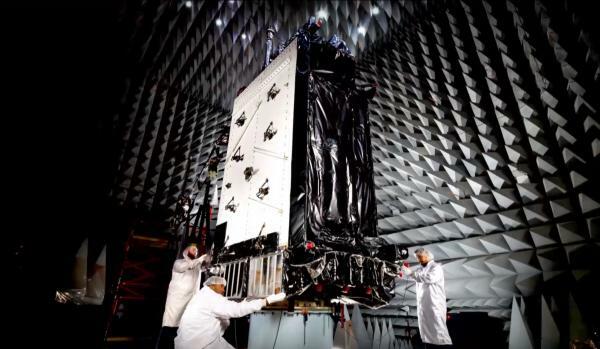 Here's the next segment in the Space and Missile Systems Center's continuing series of background videos on GPS III that answers the question, "How do you use it?" Mr. David Madden, a retired Air Force colonel and former director of SMC's Global Positioning System Directorate, describes how the upcoming modernization of the GPS III-series of position, navigation and timing (PNT) satellites and the future role and impact it will play in everyone's daily lives. Featuring cutting-edge graphics and file footage from industry partners Lockheed Martin in Littleton, Colorado and SpaceX in Hawthorne, California, this segment also covers the excitement and team partnerships for the first National Security Space launch of a GPS national asset on SpaceX's Falcon 9 launch vehicle. The Chinese have a famous proverb: 千里之行，始於足下 which is pronounced "Qiānlǐ zhī xíng, shǐyú zú xià" -- or, more commonly in English, "A journey of a thousand miles begins with a single step." It teaches us that even the longest and most difficult ventures have a starting point; something which begins with one "first" step. Technical Sgt. Justin Perran, a Joint Terminal Air Controller at Buckley Air Force Base, and Dreux Zimmer, a Logistics Management Specialist from the Space and Missile Systems Center's Global Positioning Systems Directorate, describes how the first GPS III satellite, SV-01 (also known as "Vespucci" in honor of Amerigo Vespucci, the Italian explorer for whom the Americas were named), began its first step in what will ultimately be a journey of hundreds of millions of miles over its long service life in orbit above us -- from Colorado to Cape Canaveral in preparation for its mid-December launch. So I am surprised that discussions for this one is heavily focused on the F9. I would like to ask if there's a good concise article out there on why GPS Block III was delayed by so many years (a decade IIRC) and why the ground control system (OCX) was apparently the #1 contributer for delays? Needless to say that that's not any source of info, just a collection of it (that's why it is a "wiki" section). NSF has already confirmed on one of their articles that the booster was B1054, the booster arrived a few days ago at the cape. SpaceX sets the Falcon 9 launch with GPS III for NET (No Earlier Than) December 18. Booster is still classed as "Expendable" on the Eastern Range. Hans confirmed that Falcon 9 will be in an expendable configuration for GPS III SV01 during the CRS-16 post-launch conference. Additionally, "booster is in great shape and being integrated in the hangar", suggesting that it's the core spotted in 39A. He also said that the reason for the expendable profile was a customer requirement to get as much performance as possible out of Falcon 9 - "it's a challenging mission." This makes no sense to me (so likely I'm missing something). From what we know, a recoverable F9 could put GPS-III into a very nice transfer orbit, then the satellite could circularize and have a full and productive life. Now by making the F9 expendable, they get a better transfer orbit, less for the satellite to do, and the satellite has more fuel for later. But what's the point?? What can the GPS satellite do with this extra fuel? GPS satellites hardly ever maneuver - in fact they hate maneuvering, since they need to pull them out of service until they can re-determine the orbital elements. So it makes no sense to me that the government would pay extra for an expendable launch, which only saves a resource (fuel) that they have no way to use. DOD don't care, they want as much room for contingency as possible and saving a few bucks doesn't make up for more fuel and a longer life. Also, we don't know what the contract reads. This was awarded pre-Block 5 and regular reuse. They still have to station keep , but for reasons you mention they try not to maneuver often. I think they may also move them as a contingency when satellites go offline. Given how important these beast are to the military and modern society and the uncertainties of when upgrades and replacements will happen I bet they fight for every second of usable life. But what's the point?? What can the GPS satellite do with this extra fuel? Also isn't the ground segment years behind schedule and not ready yet? Maybe they need to squeeze a few more years of on orbit life just so that when the ground segment is up and running they still have the originally designed life. Going expendable does give a higher probability of getting to at least the target orbit, by giving the upper stage extra delta-v margin. The upper stage doesn't have to burn as long, or can burn at lower thrust. How much higher? No idea, but apparently anything at all is worth it to the USAF. [..] Maybe they need to squeeze a few more years of on orbit life just so that when the ground segment is up and running they still have the originally designed life. The lifetime arguments make little sense either. Typical GPS station-keeping is less than 1 m/s, less than once per year. (From TOWARDS AUTOMATED DETERMINATION OF ORBIT MANEUVERS FOR GNSS SATELLITES.) So a single year's budget for a comsat (50 m/s) would last a GPS satellite more than a century. Now this does not include changing positions within a plane, but that's infrequent and takes little dV if not done in a hurry. So surely something else will fail long before any GPS satellite runs out of fuel, and adding hundreds of m/s to this budget makes no sense. Air Force and SpaceX taking the opportunity to demonstrate additional capabilities which might be useful for future missions? Sort of like doing extra credit in a course where you've already got an A. Well, the expendable mission means there's no need to delay or anything to double check hydraulic pumps, etc on this flight. They've got 3 1/2 weeks until they have to land a stage again.